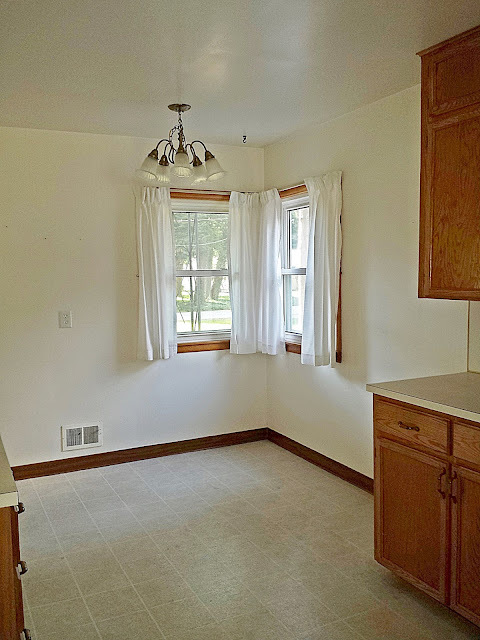 When we first looked at our new house, we thought we loved the kitchen. The cabinets looked in great shape and they go all the way to the ceiling making them look custom. In fact, everyone who has seen the house since we bought it has thought the cabinets are great. As you can see, it isn’t a terrible kitchen. It actually looks pretty good. 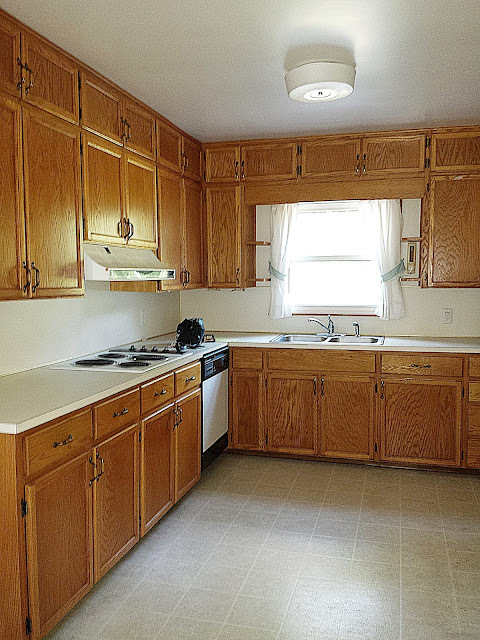 Slap some paint on the cabinets, replace the countertops and floors, and we’re good to go. We knew the layout wasn’t perfect, but we thought we could work with it. Then we started looking closer. How the kitchen looked on the day we took possession of the house. The cooktop is okay, but the oven is so not in a good place at all. It was completely outside of the work triangle. Imagine trying to cook dinner with guests in the kitchen! Impossible!! The refrigerator blocked the kitchen off and made it feel closed in, and the dishwasher was in a corner which made it impossible to open one of the drawers unless the dishwasher was open. There were some definite problems. Nothing made sense, except the cooktop and the sink. 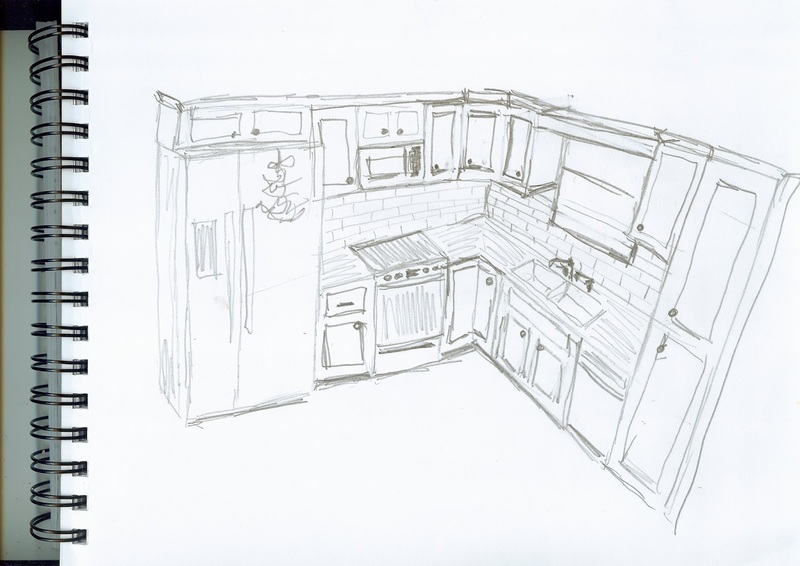 Everything else was awkward, but from the start, our plan was to sell the appliances, reconfigure the cabinets and use our own stainless steel appliances. We thought we could make it work without too much trouble. The kitchen on inspection day. 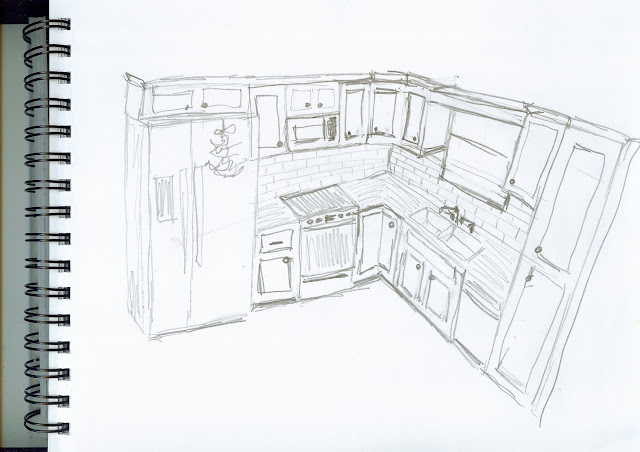 Then we found out the cabinets truly are custom, and we couldn’t just reconfigure them to fit our appliances. They are all one piece! 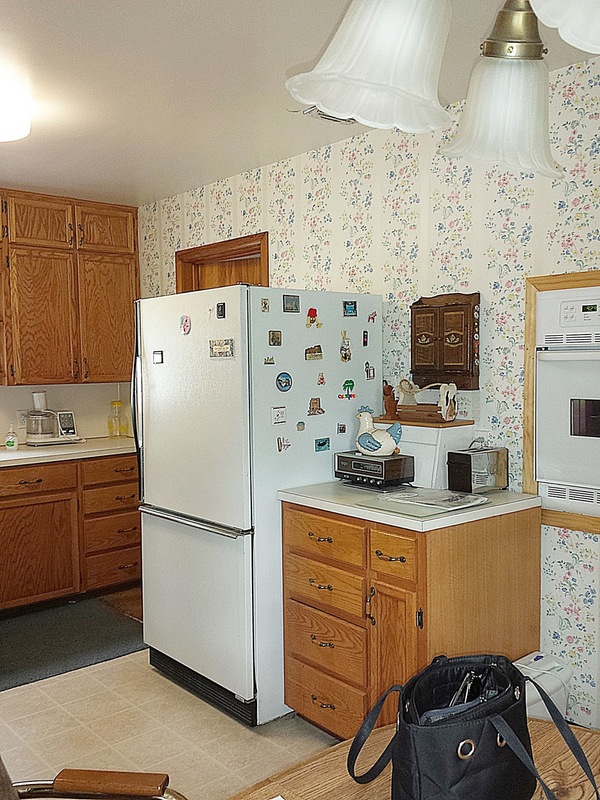 Seriously, those very top cabinets are open with no dividers all the way around the cabinets. We’d have to cobble them up, and we knew that’s exactly what it would look like–a cobbled mess. So, onto plan B, which was to replace all the cabinets. I have to admit, when Jim suggested starting from scratch with all new cabinets, I was very excited. In fact, I even posted it about it, but I could tell you what was actually going on, because I didn’t want to jinx anything. My original design with colors, fabrics, and finishes. This was the original plan I came up with. The original plan was stock unpainted cabinet from a big box store. With everything else we needed to change, that seemed the best option for our budget. But that’s all changed. We found an extremely talented Amish cabinet maker who is making all our cabinets. Now the refrigerator is going to look built-in. The cabinets are going all the way up to the ceiling, and pantry is going to include two drawers and pull-out shelves. Plus, all the appliances are going to be in the work triangle, which will make entertaining easier. A funny story… When I told Mary, who is the trustee of her parents’ estate and who we bought the house from, that we were tearing out the kitchen and replacing the cabinets, she laughed and told me that her mother hated those cabinets. Her dad loved them and insisted that they be refaced in the 1980’s even though her mom wanted to replace them. We’re thinking about putting banquette seating in this corner. This weekend, we met with Rudy, our cabinet maker, gave him a deposit. Then we went to Lumber Liquidator to look at laminate floors. We didn’t find any flooring we liked there, but we did end up buying our walnut butcher block countertop instead. I can’t tell you how excited I am to be getting custom cabinets and butcher block countertops! I’ve wanted walnut countertops forever! 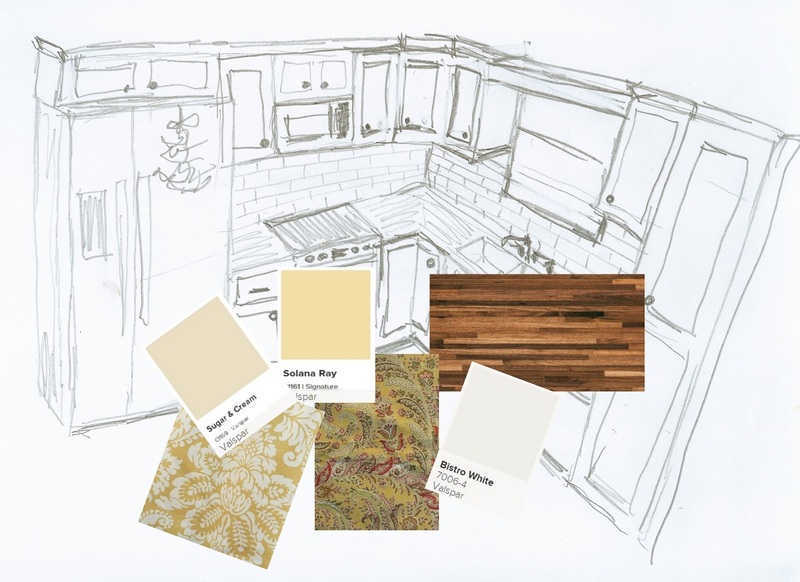 There are a few more surprises… For instance, I’m sure most of you are expecting me to have white painted cabinets, because you know how much I love white kitchens. But that’s not happening. I’m actually going to have yellow cabinets! I can’t wait to show you how it turns out! The wall between the living and dining room is opened up. Updated paint and color schemes. New curtains for the family room. 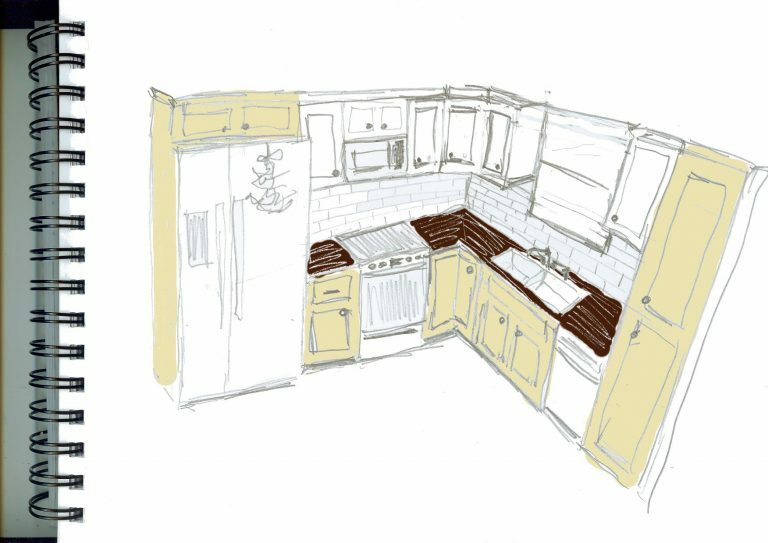 So you’ve seen the kitchen space the way it is now… Any suggestions or ideas you want to share? Share your thoughts!!! I love hearing your ideas! I have seen the plan for the cabinets. It is going to be gorgeous, very cottage like and classic at the same time. Loribeth always does things that are creative and pretty. Cannot wait to see everything finished! Thank you, Kate! I can't wait to see everything finished too! This is the first time I'll have had a completely brand new kitchen, so I'm pretty excited.